V4 Report: EU Minister Dimitris Avramopoulos (Greece) and leaders of Western Europe clashed again with the Visegrad states regarding migrant quotas. This battle over quotas will get “ugly”. It is clear that this is not a refugee crisis, but a crisis of internal weakness. The leaders of Luxembourg and the so-called “EU Core” simply have no will to defend their border, culture or people. Sadly, many no longer believe in a culture to preserve. In 2015, the EU called for an emergency program to relocate 40,000 migrants, but then this quickly morphed into a “one time” scheme of 160,000. Today, Brussels wants another program, this time including new migrants from countries in Africa. Where and when does it end? Unfortunately, unless this relocation mechanism is unconditionally defeated, it will never stop. Brussels wants to make it “permanent” in order to “commit” Europe to mass migration. 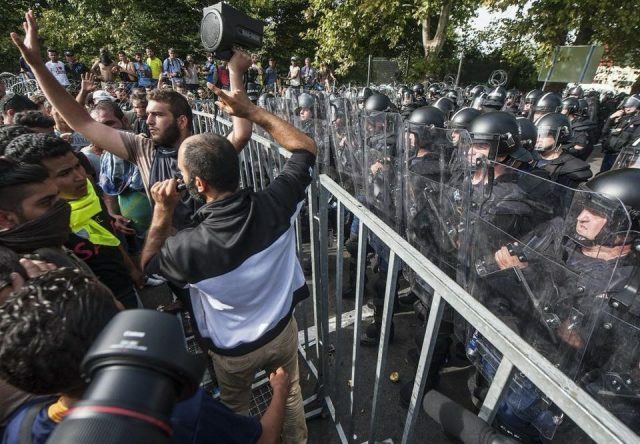 From the start, the Visegrad nations, led by Viktor Orban, called for the borders to be secured, warning Brussels and Berlin of surrendering the border to unknown, aggressive male migrants from violent cultures and regions containing Islamic terrorists. Visegrad wanted to protect Europeans first while offering help to the true refugees closer to their homes. The leaders of Germany, Italy and Greece freely chose a different path, while Sweden and Austria blindly followed. It was their choice to grant “open entry” instead of sealing the border. Today, as a result of their negligent and reckless experiment, it is their people that suffer the consequences. Ironically, some of these same nations are now trying to bribe the migrants to go home. Good luck! – Angela Merkel, who lured the migrants while proclaiming Germany’s greatness, now says it is a question of “EU solidarity” and wants to relocate the migrants across Europe instead of returning them to their countries of origin. “We cannot leave it all to the countries at the external borders (of the EU). We need relocation in times of crisis….If we do not manage this, we will choke on it.” Luxembourg’s Jean Asselborn said. The border is what “collapsed” and no system can “manage” this. Contrary to the feeble statements of Luxembourg, the Visegrad nations – on several occasions – offered both Italy and Greece troops and equipment to help secure the border. Not only were they refused, but Gentiloni, Renzi and Tsipras were “insulted” at the suggestion. “The quota is not a good thing. But we still have other solutions,” said Slovak ?? Interior Minister Robert Kalinak, referring to another proposal by the Visegrad states to contribute money, experts and equipment instead of accepting migrants. One cannot just surrender their borders to smugglers and illegal migrants without blowback. Today, because they refused to take decisive action to control events, Germany, Italy and Greece are now held hostage by the actions of others. Perhaps the most arrogant and simplistic statement came from the mouth of EU migration chief, Dimitris Avramopoulos, who said the “stalemate” had much to do with populist politicians stoking up immigration fears among voters. “It’s a question of how you think politically addressing your domestic audience,” he said. Avramopoulos now wants Brussels to instruct Central Europeans how “to think”. He is in for a surprise. “EU Solidarity” is a myth invented by Angela Merkel to suit her own agenda. The reality: there was never any European Solidarity for open-borders, mass migration or forced multicult. One can see the situation in Africa. The EU will either secure the border, or the “EU Project” and Schengen will die. Visegrad and other CEE states – based on the model of the Three Seas Initiative – will have to build their own foundation. This will take time and will not happen overnight, but we believe it is inevitable. This just cannot go on indefinitely; something will have to give.